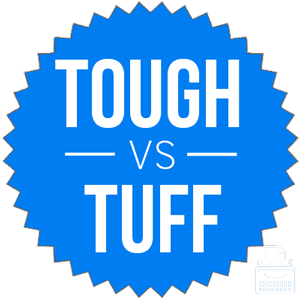 Home » Tuff or Tough – What’s the Difference? There are so many products on the market today—and so many associated copyrights and trademarks—that it can be difficult to carve out your own niche in the marketplace. Brand recognition plays a role in this endeavor, and one way to enhance brand recognition is to make your product name memorable. One of the less sophisticated ways of doing so is to misspell something on purpose. In some particularly frustrating instances, tough becomes tuff, really for no good reason. Should you use the simplified version or spell the word correctly? What is the Difference Between Tuff and Tough? In this post, I will compare tough vs. tuff. I will use each of these words in several example sentences, so that you can see them in context. I will also show you a helpful memory tool that you can use to remind yourself whether tough or tuff is the correct word. What does tough mean? Tough is usually an adjective that means hardy, not easily damaged, or sometimes, difficult to chew. Beef jerky is usually tough, and stainless steel is an excellent material for cookware because it is tough. Sara cooked the steak too long, and Eddie complained that it was tough and flavorless. The Dodgers are a tough team to beat now that they’ve learned how to hit left-handed pitching. The adjective tough becomes tougher in the comparative, and toughest in the superlative. The associated noun is toughness. Sometimes, tough is a verb. The phrase tough it out means endure, for example. If you are wounded on a battlefield, you will likely need to tough it out until you can get to a medic. Another similar phrase is toughen up. Tough is occasionally an adverb, too. The phrase hang tough also means to endure, much like hang in there. What does tuff mean? Tuff, on the other hand, is a noun. A tuff is a type of porous rock formed from volcanic ash. It is common in several parts of the world. Thousands of years ago, the Rapa Nui fashioned the famous mo’ai head statues on Easter Island out of tuff. Tuff is plentiful in Italy, and the Romans used it extensively in construction. Some of the iconic rock formations in Yellowstone National Park are a type of tuff. Tuff is often used in place of tough in commercial products, such as sheds and country & western inspired women’s clothing. This usage is considered improper English. If the word you are using is an adjective or a verb, use tough. Tuff is only correct when used as a noun that references a certain type of rock. If you are writing about a specific commercial product that includes tuff as part of a proper name, this usage is also acceptable. For all other contexts, though, tough is the correct spelling of this word. Tough is a tough word to spell, so by remembering the meaning of the word, you can also remember its unusual spelling. Additionally, a tuff is a rock formation. Tuff and formation both contain the letter f, which will give you a clue that you only use tuff to refer to formations of rocks. Is it tuff or tough? Tough is an adjective that means strong or difficult and a verb that means to endure. Tuff is a type of rock, and is used in place of tough in some commercial products. Use tough unless you are writing about rocks or a specific product. 1 What is the Difference Between Tuff and Tough?